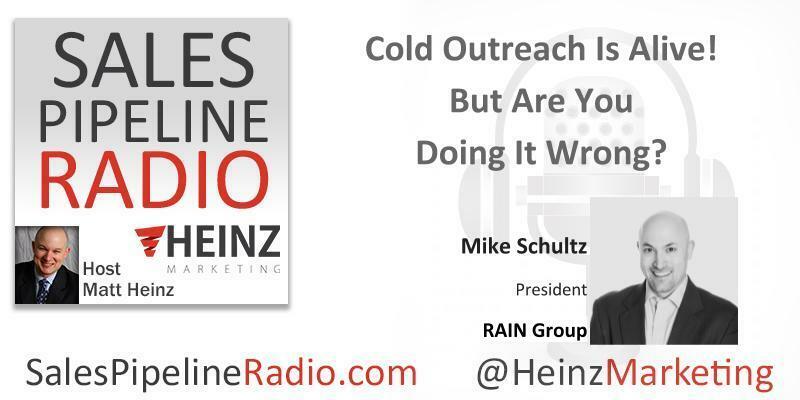 President of RAIN Group, Mike Schultz is world-renowned as a consultant and sales expert. He is co-author of several books including the Wall Street Journal bestseller Rainmaking Conversations: How to Influence, Persuade, and Sell in Any Situation (Wiley, 2011) and Insight Selling: Surprising Research on What Sales Winners Do Differently (Wiley, 2014). He was named the Top Sales Thought Leader globally in 2011 by Top Sales Awards. Mike and the team at RAIN Group have worked with organizations such as Toyota, Monitor-Deloitte, Harvard Business School, Oracle, Fidelity Investments, Ryder, Quintiles, UL, Navigant Consulting, Hitachi, Lee Hecht Harrison, Lowe’s, and hundreds of others to unleash sales performance. News outlets such as Business Week, The Globe and Mail, Inc. Magazine, MSNBC, and hundreds of others have featured Mike's original articles and white papers, and frequently quote him as an expert. Mike’s most recent research includes What Sales Winners Do Differently,Top Performance in Strategic Account Management, and theTop-Performing Sales Organization. Along with his books, Mike has written hundreds of articles, case studies, research reports, white papers, and other publications in the areas of selling and marketing. He also writes for the RAIN Group Sales Blog. Mike is also the director of the RAIN Group Center for Sales Research. Mike is a graduate of Brandeis University in Waltham, MA with a B.A. in American Studies, and holds an MBA from the F.W. Olin Graduate School of Business at Babson College. Mike is currently on the faculty teaching sales at the Brandeis International Business School. Mike also enjoys fly fishing and golf, and actively studies and teaches the traditional martial arts of Seirenkai Karate and Jujitsu, holding the ranks of third degree black belt and Sensei. He lives on a lake west of Boston. Lead follow-up failure. Whose fault is it? Join us LIVE 11:30 am PST Thurs. 1/11/18 when Alex Terry, CEO of Conversica joins us to talk about the findings of the highly regarded 4 P's Report. For the third year in a row, Conversica commissioned an in-depth study tracking lead follow-up efforts of B2B and B2C companies across a number of different industries. In 2017, they found that a staggering 77% of companies under-touched their leads. Check back here for the ON-DEMAND Recording of this broadcast -- no later than 1/16 or on the Heinz Marketing Blog on Mon. 1/22 along with the full transcript. AND--- Join us 1/23/18 11am PST for a free 60-minute, live webinar on this topic as well (on-demand afterward). 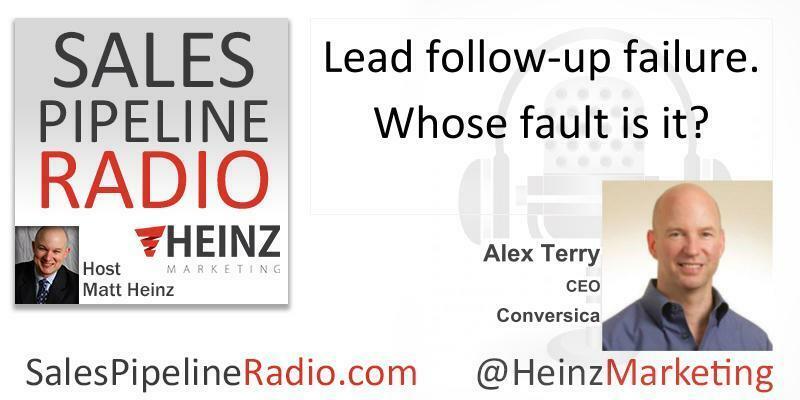 Terry will join Nancy Nardin of Smart Selling Tools and I to give our "lively" perspective from the Sales (Nancy) and Marketing (Matt) fronts on lead follow up failure AND share best practices for how to do it right. Terry is an accomplished and award winning Internet business veteran with strong track record of driving results and growth. He founded or co-founded three companies and one division within Fortune 100 corporation. From idea to revenue generation, to profitability to exit... he is able to manage all aspects of consumer or enterprise service or product business. Focus has been on SaaS, operationally complex services which required disruptive new technology development. He holds multiple patents for Internet services. Alex received his MBA at Harvard Business School and his BA at Dartmouth College. 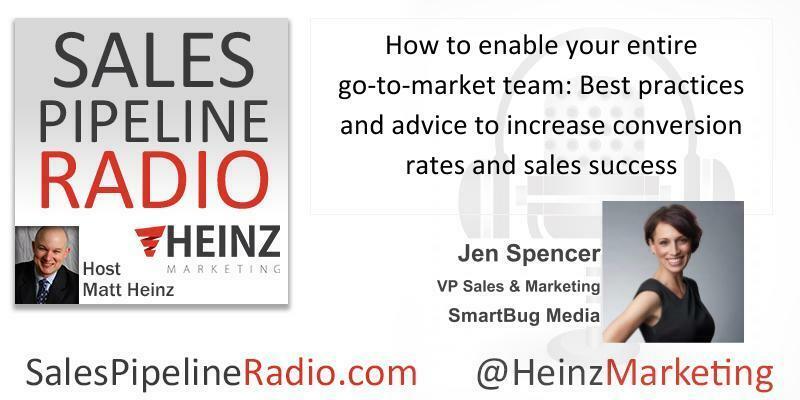 Don't miss this week's guest, Jen Spencer, VP of Sales & Marketing at SmartBug Media. We'll be live at 11:30 PST Thurs. 1/4. Check back here for the recording no later than 1/8/18 and read the transcript on the Heinz Marketing blog on Mon. 1/15/18. Jen Spencer is Vice President, Sales & Marketing for SmartBug Media, a leading intelligent inbound marketing agency that assists businesses in generating leads; increasing awareness; and building brand loyalty through inbound marketing, digital strategy, design, marketing automation, and PR. Prior to her role at SmartBug, Jen was the VP of Sales and Marketing at Allbound, a partner sales acceleration software-as-a-service solution provider. She was responsible for developing and executing an inbound demand generation strategy, raising brand and market awareness for Allbound, and channel sales and marketing. She helped the company reach 50 percent growth in year-over-year traffic and a 363 percent increase in sales leads. While serving as Director of Marketing at nettime solutions, acquired by Paychex in June 2014, Jen developed and executed an inbound lead generation and content marketing strategy while supporting a channel of referral, reseller, co-branded, and white-labeled partners. Through her role, the company saw a 103 percent increase in website traffic, a 415 percent increase in direct sales leads, and an 89 percent increase in revenue. Whether she’s writing a blog, delivering a speech, interviewing clients or managing agency relationships, aligning with her audience is always at the forefront of her mind. Jen subscribes to the notion that “we’re all in this together,” and great communication leads to great partnership. In her free time, Jen serves on the Board of Girls in Tech - Phoenix, a local chapter of the global non-profit focused on the engagement, education and empowerment of girls and women who are passionate about technology. If you get to know Jen, you'll discover she loves animals, technology, the arts, and really good Scotch. She's also the mother of twin teenage boys which means there's likely a lone dirty sock in every room of her house. Let's start with her first book, Predictable Revenue. Page 42 - formula in the Predictable Revenue book. Dogear it, bookmark in your Kindle version. This is what you need to focus on. Her latest book, Predictable Prospecting, is the result of the thesis of page 42. She spent five years developing this book by working with clients in the field to consolidate and fine-tune, grow the formula, scientifically focus to get benchmark of conversion rates and ratios that will add up to a predictable revenue framework.And then honing in on specific pieces, buckets, and components to put this channel in as part of a mutli-channel marketing effort to generate revenue in targeted accounts with the highest likelihood of closing with the highest revenue potential. Blending the knowledge of marketing, flipping it sideways and pulling out the pieces that will resonate with those at the top of funnel - this is one stream - OUTREACH for large accounts that close quickly. That is the role of a prospector. They have to make calls, they have to have conversation. Top of funnel we worry about 5 different levels of awareness. How do we figure out where they are, how do we start the conversation and how do we move them along? Catch this full replay here. 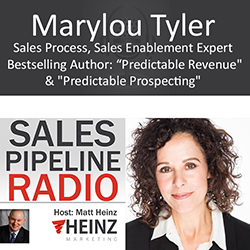 Marylou tells us, "I’m Founder of Strategic Pipeline, a Fortune 1000 sales process improvement consulting group. Our client roster includes prestigious companies - Apple, Bose, AMA, Talend, CIBC, Gartner, Prudential, UPS, Logitech, Orkin, AAA and Mastercard. I’m also co-author of the #1 Bestseller Predictable Revenue. It's sold over 50,000 copies with 250+ reviews (avg. 4.3 stars). And my new book (McGraw-Hill August 2016) is titled Predictable Prospecting: How to Radically Increase Your Sales B2B Pipeline. I specialize in optimizing top-of-funnel sales process and implementing predictable new sales opportunity engines. My approach walks clients through a 7-point outreach process/framework that is part behavioral, part predictive and part creative (persuasive storytelling)." Mark Hunter is here to talk about sales. His new book: High Profit Prospecting, and his best seller give him the credibility that you need to listen in, take notes. We dove right in. If you have to discount the price to close the deal, that means you are prospecting the wrong people. You can't make a WalMart shopper into a Nordstrom Customer. Social Media without Social Community is Social Stupidity. It's a conduit. You must have something to share that is of value. Think about this, too - how to leave an 8-11 second voice mail message. Stop embarrassing yourself. Matt reminds us that phone and email are NOT dead. The phone is the most valuable tool he uses. Stop being afraid to prospect and defaulting to social media. Don't hide behind social posts, tweets, likes, and emoticons. PICK UP THE TELEPHONE. It's an amazing tool when used right. You should learn one piece of information about them in the first call and begin to engage them. Do you have call or prospecting reluctance? Why? You don't have to close them in the first call. Your objective is to earn the right, privilege and respect to be able to call them again. COLD calling is dead. NOT CALLING, COLD CALLING is dead. You need to know something about them, their industry, their pain. 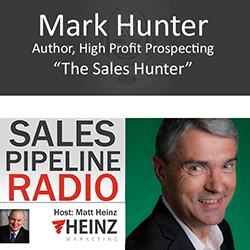 There are valuable tips in this episode, questions you need to ask yourself and your reps.
Mark Hunter is "The Sales Hunter." He helps companies and salespeople find and retain better customers. He is also the author of the best-selling book, High-Profit Selling. He is recognized as one of the "Top 50 Most Influential Sales and Marketing Leaders." All of this has him traveling globally nearly 230 days per year, working with companies to help them grow their top-line sales and bottom-line profits. He is known for his sales growth strategies and consultative selling approach to business. Mark Hunter is frequently quoted in the media and is a keynote speaker at major conferences on the subject of sales and sales leadership. His sales techniques are in use today by salespeople on 5 continents and in more than 100 different countries.